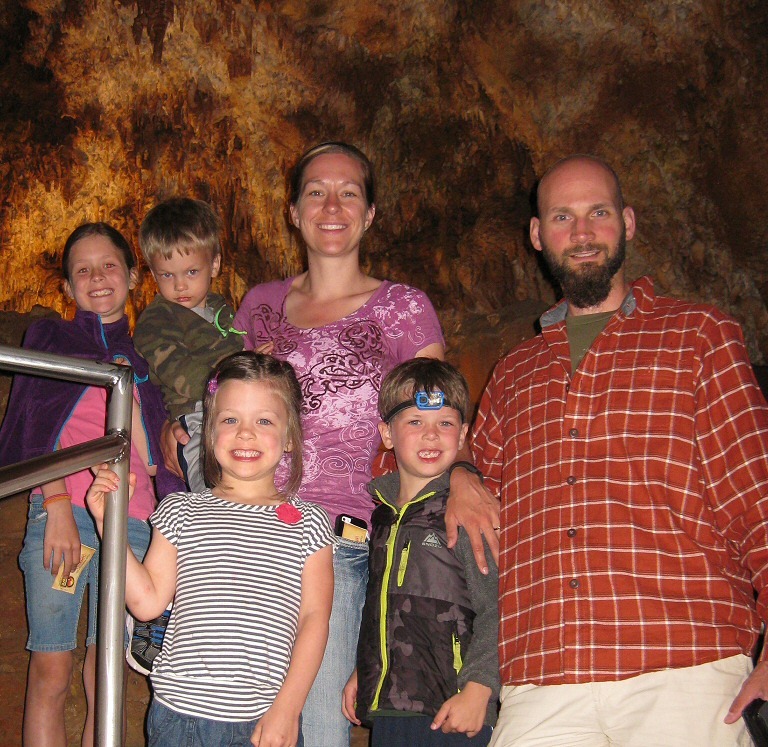 Last month Nicoleen, I, and the 4 oldest kids embarked on our first real family vacation. 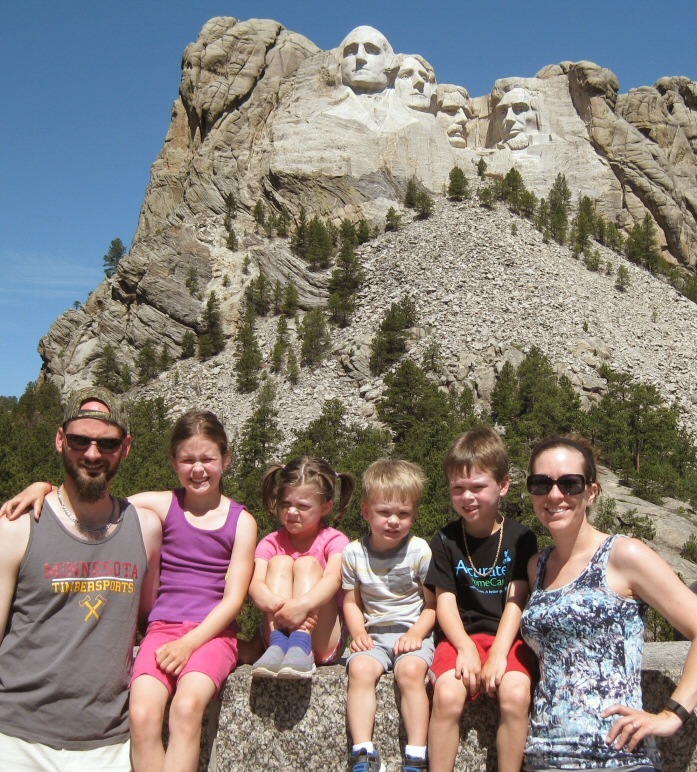 We anticipated some challenges in traveling with 4 kids aged 8 and under, so we planned a pretty simple and straight forward trip. 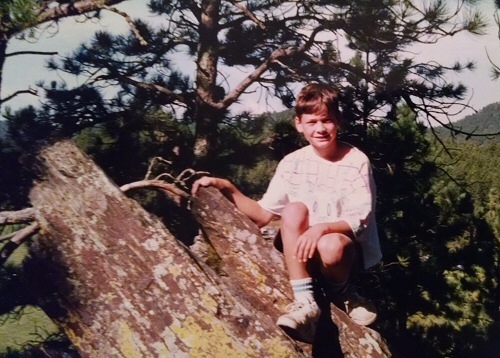 The plan was for 5 days and 4 nights in the Black Hills of South Dakota. We wanted to camp primarily, but I couldn’t in good conscience plan a whole vacation without getting something for free, so we looked for a hotel in Rapid City where we could recharge after our first day which would mostly be spent in a cramped car. After the fun traveling Nicoleen and I have done over the past couple of years, we thought the kids deserved to get in on some of the action too. They are ages 8, 6, 4, 2, and <1 so they are just getting to the age where they will appreciate and remember their travel experiences. We figured for our first attempt at a family vacation we should do something simple, so flying and dealing with a rental car were out of the question. Living in the Minneapolis area, South Dakota seemed a logical choice. There’s plenty of stuff to do in any kind of weather, and the 10-11 hour drive is short enough to make in a single day, yet it puts you far enough away to really get away and change the scenery. 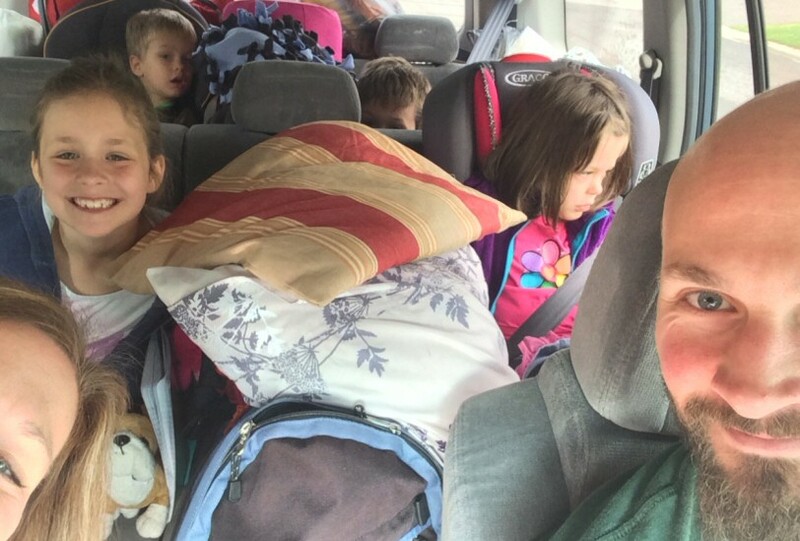 The kids were a bit restless on our long drive from eastern Minnesota to western South Dakota. 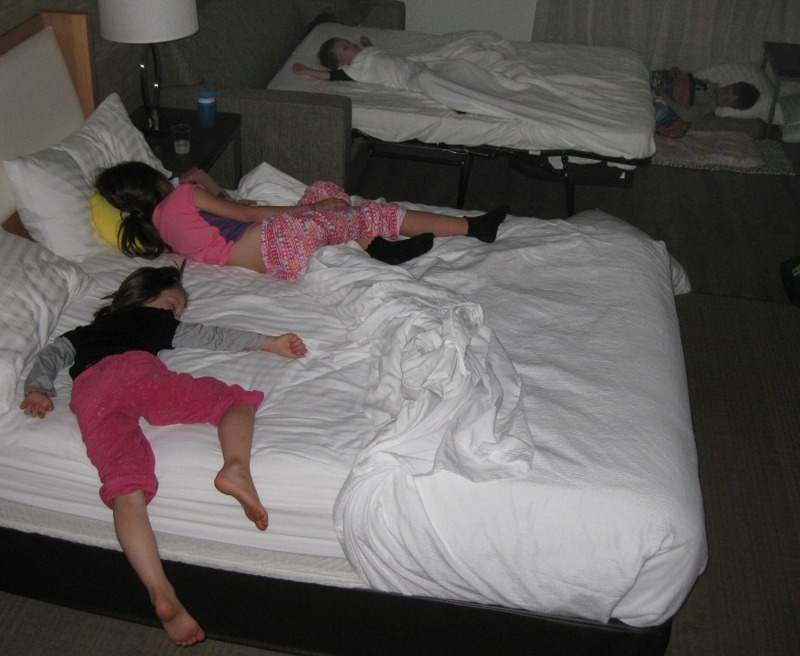 I will definitely have to spend more time reading Mommy Points and Points with a Crew for some tips on traveling with kids. 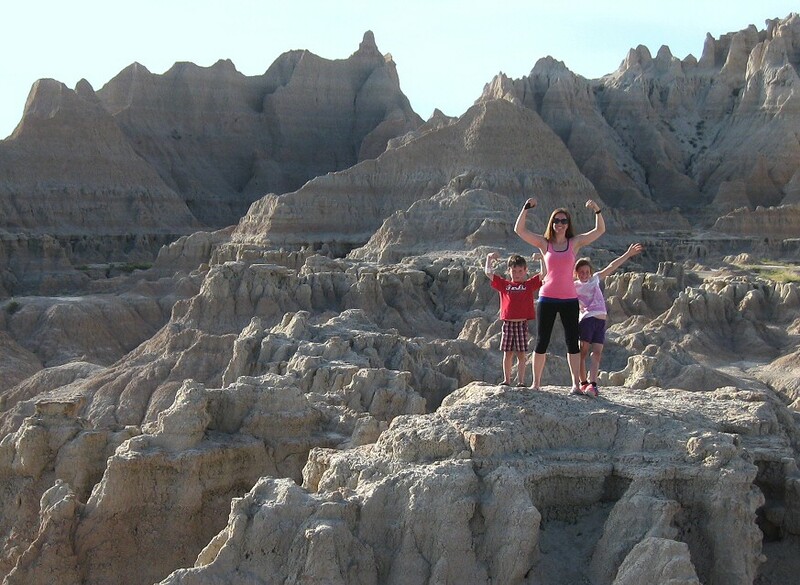 By the time we reached the Badlands we were all ready to stretch our legs and burn off some energy. We took the Badlands loop highway (Hwy 240) and got out to climb around a bit. The heat in early June was downright oppressive. Those are some tuckered out kids! We won’t try to see everything in one trip. First of all it’s impossible. Second of all, it relieves the pressure to make it to any given attraction; we can always hit it the next time we’re here. We won’t plan our days in advance. Especially because the kids are along, we need to stay flexible. This will also help us deal with any bad weather we might get. Having one or two rainy day activities in the hopper at any given time will help greatly if the skies don’t cooperate. Let’s not fill up every day with activities. The campground has a pool and lots of rocky areas to explore. 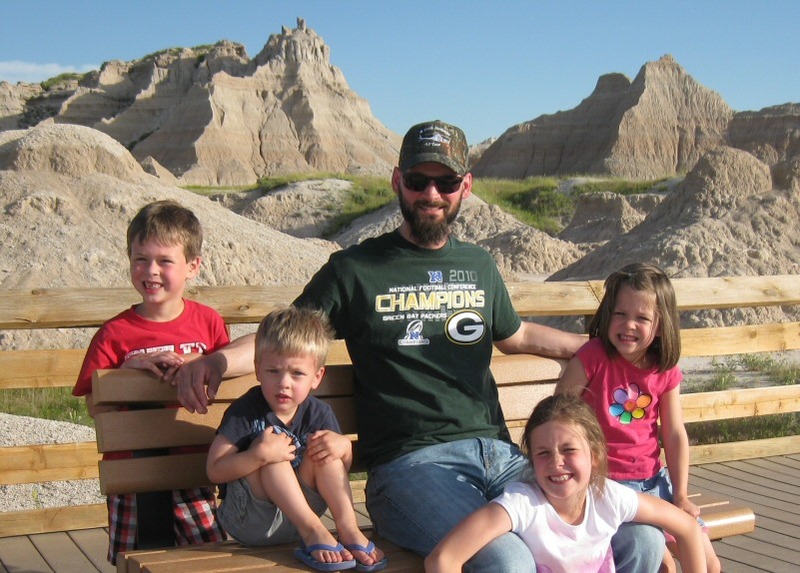 The kids will have just as much fun roaming around as they will on a structured outing, and mom and dad will probably need some down time to just sit and have a beer. These principles ended up being pretty helpful. Of course we did a few of the must-see attractions like Mt. 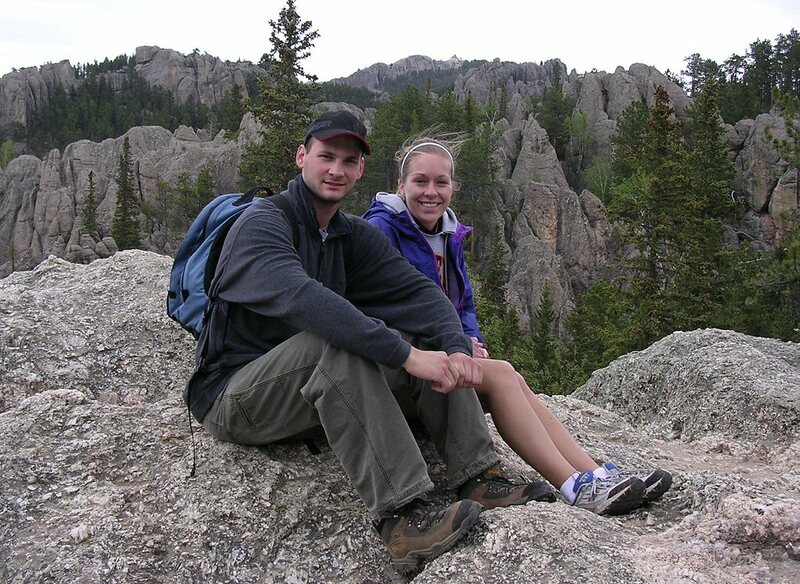 Rushmore, the wildlife loop at Custer State Park, and Needles Highway. The whole family (less the baby), squinting for the camera at Mt. Rushmore. 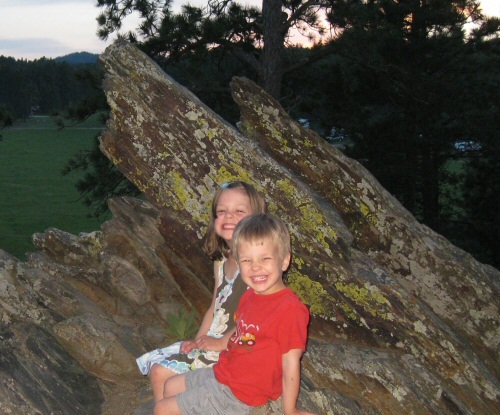 It was in the upper 90s by noon.
. . . but the kids’ best memories of the trip will probably be of swimming at the campground pool, climbing around the rock outcrop behind the campsite, swimming, meeting little friends from neighboring sites, and swimming. 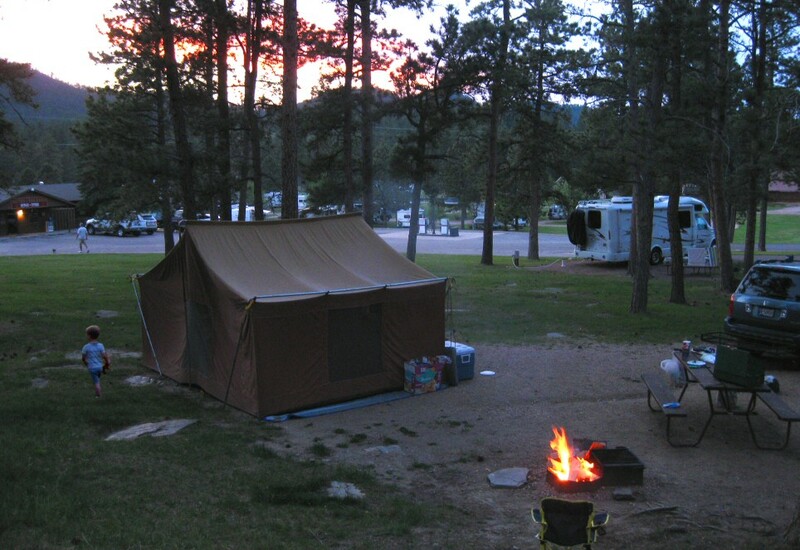 For our three nights in the tent, we chose Rafter J-Bar Ranch Campround outside of Hill City, SD. I have stayed at Rafter J-Bar on most of my previous Black Hills trips and year after year it continues to deliver. We stayed in the main camp, at site #2, which is right across the road from the office/store and pool. The whole place is very clean and well taken care of. Our site with no electric was $43.95 +tax per night. That’s spendy for a tent site, but still cheaper than a hotel. Nicoleen and I were disappointed to find out that the campground was no longer a “ranch campground,” as they emptied the stables several years ago and no longer offer trail rides. However, we were happy to see that not much else has changed. 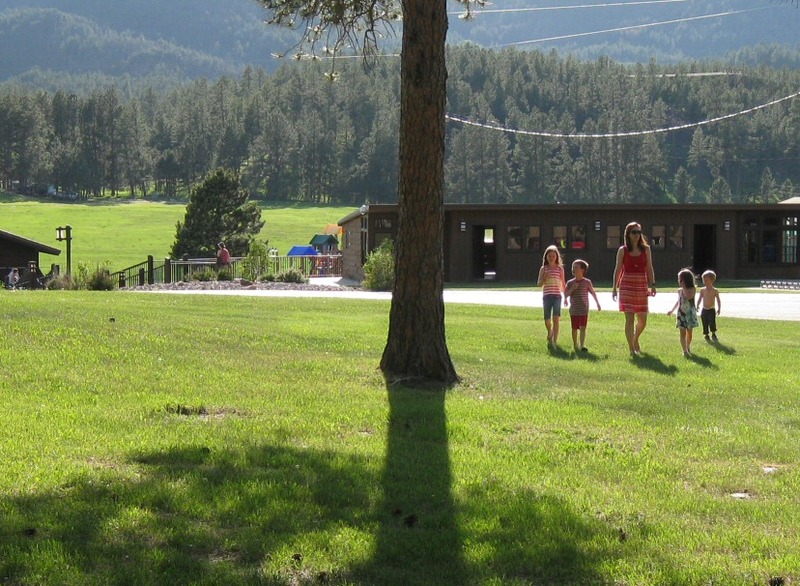 The staff is still friendly, the pool is still wet, and kids still enjoy exploring the natural areas. Rocks don’t change. Me in 1994 and my kids in 2016! Although this trip didn’t utilize a lot of free travel tactics, we used value tactics throughout. We put all our spending on credit cards to earn more points and miles and we bought a cooler full of food before we left home, to keep our dining costs down. We also realized that with all these young kids along, simple activities like the swimming pool and campfires would be just as fun for them (and free) than trying to cram every day full of paid entertainment. 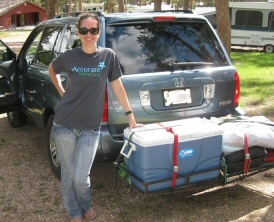 Nicoleen’s loaded down Honda Pilot got around 17-18 mpg on average. The constant air conditioning and many hills brought the fuel economy down. We spent about $175 on gas. There weren’t any Super Americas along our way, so we were unable to utilize our normal free gas tactics. The campground was $139.10 for three nights. This seems expensive for camping but it’s a tourist area so all the rates are higher. Even so, it’s not a bad price for 3 nights’ lodging for 6 people! The hotel was a different story: we got a room that retails for $215.55 and paid $0.00 for it! It cost us 35,000 IHG points, for a redemption value of 0.62 cents per point. Not a very good rate, but it was still nice to get the hotel at no cost! This part is very subjective and reporting my costs here is pretty meaningless. You can spend what you want on these parts of the trip. We were pretty frugal and only spent around $300. It seemed like we got little snacks along the way whenever we wanted, so in that sense we didn’t hold back. But I think bringing that huge cooler full of food and drink really helped this cost stay down. OVERALL this was a very fun trip! The kids were a challenge sometimes but I think they really got a lot of good memories out of the deal. Road trips are hard to work value tactics into, but the free night at the hotel was definitely a welcome segment of the trip. This entry was posted in IHG, My Story, Trip Reports and tagged Camping, Holiday Inn, South Dakota on July 29, 2016 by Gomanson. Principle #4: a bag of dollar buns and a jar of peanut butter is all you need to feed your 2-year-old.